Adventure runs wild when renowned paleontologist Dr. Alan Grant agrees to accompany a wealthy adventurer and his wife on an aerial tour of Isla Sorna, InGen’s former breeding ground for prehistoric creatures. But when they’re terrifyingly stranded, Dr. Grant discovers that his hosts are not what they seem, and the island’s native inhabitants are smarter, faster, fiercer and more brutal than he ever imagined. After the original Jurassic Park was released, Joe Johnston approached Steven Spielberg telling him he was interested in making a sequel to it. As Spielberg wanted to direct the first sequel, he said Johnston could do the third film if one ever came to pass. Johnston’s general idea for the film would be that it would be “more stand-alone” and involve lots of flying reptiles. 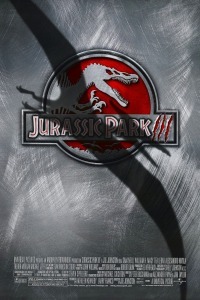 Jurassic Park 3 was greenlit by the studio in August 1999 and an in early script written by Craig Rosenberg, the story was about some teenagers who get stranded on Isla Sorna. Another story involved Alan Grant living in a tree somewhere on the island, studying the dinosaurs. Another script was written that was about Pteranodons escaping from Site B and killing people on the mainland. This was going to be investigated by Alan Grant, Billy Brennan, a naturalist named Simone, a tough military attaché, wealthy Paul Roby, and Roby’s teenage son Miles. The characters crash land on the island while another investigation was happening on the mainland. In the script, the scene in the abandoned laboratory and the bird-cage sequences were much longer. 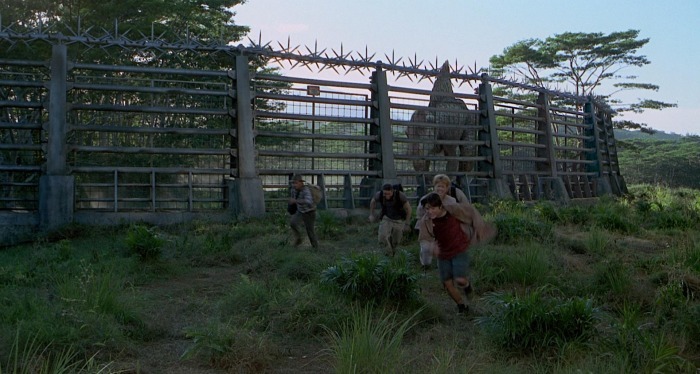 The velociraptors were going to sneak into the hatchery as the characters stay there overnight. Sets were built for this sequence but Joe Johnston rejected the entire scripts five weeks before filming was to begin on Jurassic Park 3. He wanted to go down another route of having a rescue story, as suggested by David Koepp. The script was never actually finished during production. The script contained some scenes from Michael Crichton’s original Jurassic Park novel including the Pteranodons in the aviary and the boat in the final act. Unlike the previous two films of having the T-Rex as the central creature, a new one was created for JP3 – the Spinosaurus. As most dinosaurs’ silhouettes are similar to the T-Rex’s, director Joe Johnston said he wanted audiences to know it was a different creature this time around. Before the Spinosaurus was chosen as the big dinosaur, a Baryonyx was also considered. There were some alternative endings involving the Spinosaurus too. Initially, it was going to be killed by a pack of Velociraptors. Another ending had it attacking the marines on the beach too. These scenes were cut before filming began. 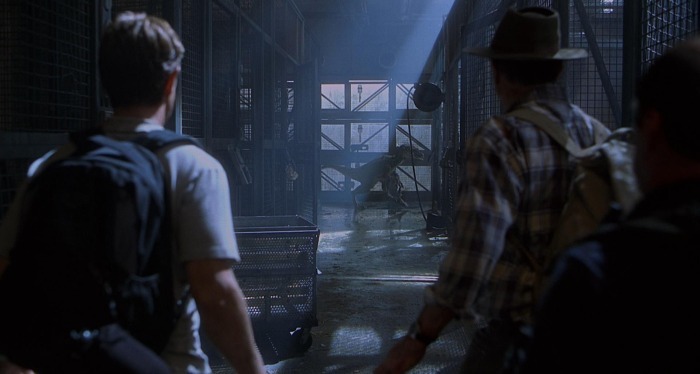 In early pre-production, artists created some advertising for the film using some working titles including Jurassic Park: Extinction and Jurassic Park: Breakout. A teaser trailer made its debut with Pokemon: The Movie 2000 on July 21, 2000. Production on Jurassic Park 3 officially began on August 30, 2000 with filming taking place in California, Oahu and Molokai. The special effects in the film included both animatronics and CGI like in the previous films. Some of the dinosaurs’ appearances had changed since the previous films due to recent discoveries and theories about them. One of these theories was that Velociraptors had feathers so the crew added quill-like structures on the head and neck of the male raptors. Steven Spielberg recommended Don Davis to write the Jurassic Park 3 score as composer John Williams was already busy working on A.I. Artificial Intelligence. The film’s score followed the same sounds as the previous films but with new additions for the Spinosaurus. Jurassic Park 3 made $181,171,875 in the US and $368,780,809 worldwide, earning considerably less than the previous films. Jurassic Park 3 was released on VHS and DVD in December 2001. It was a part of the Jurassic Park Trilogy set at the same time as well as the Jurassic Park Adventure Pack in November 2005. 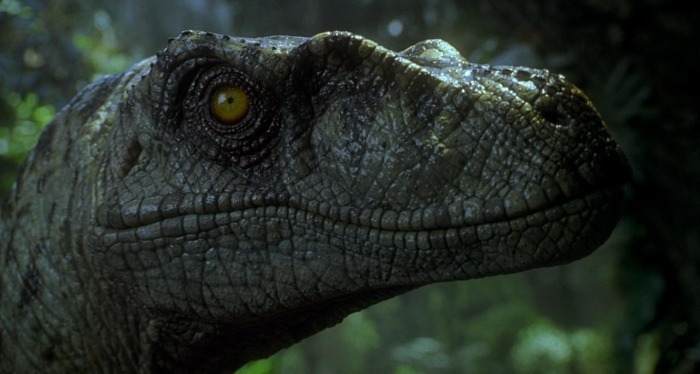 The film was released on Blu-Ray in 2011 as part of the Jurassic Park Trilogy Blu-Ray set. 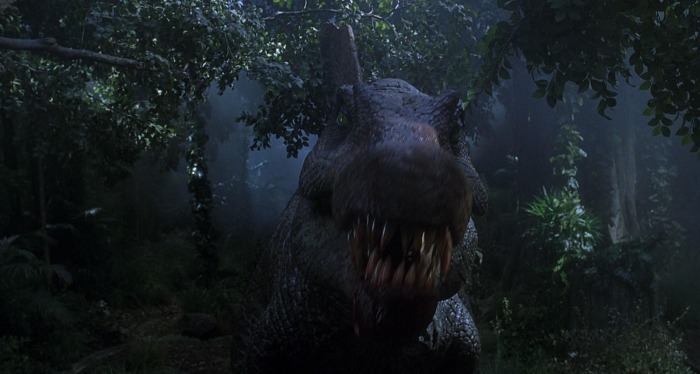 Like The Lost World, Jurassic Park 3 received a mixed reaction from film critics. It currently holds a 49% rotten rating on RottenTomatoes based on 158 reviews. Criticism was aimed at the story, the lack of characterisation and because it was too similar to the other films with no new ideas or innovations. The 90-minute length also received a lot of criticism as the first two Jurassic Park films were much longer. Videos games and an arcade game from Konami were released around the time of Jurassic Park 3‘s release. A novelization was released which was aimed at children. Scott Ciencin also wrote three children’s books to tie in with the movie. Hasbro released some 3.75″ action figures in Spring 2001 for the film’s release which included electronic dinosaurs, humans and vehicles. Much smaller die-cast toys were made too. Jurassic Park 3 Script – This is the only Jurassic Park 3 script online and it’s unknown what draft it was. Spinosaurus is the largest carnivore ever to walk the earth at 60 ft long! Is that a spinosaurus or “spine lizard”?